The Encyclopædia Britannica is a big, famous encyclopaedia. Since 2010 it is out of print in paper versions, but still published digitally. It is written in English, and is published by Encyclopaedia Britannica, Inc, a private company. It was originally only printed on paper, but late in the 20th century it expanded to have digital, or computer versions as well. The encyclopedia is split into many books. The articles in the books are arranged in alphabetical order. There have been versions of it that are for children as well. It is the largest printed encyclopedia in English, and the second largest encyclopedia. The largest is Wikipedia. Many people consider it to be the best encyclopedia, because they think it is accurate and has lots of detail. 15th edition of the Britannica. The initial volume with the green spine is the Propædia; the red-spined and black-spined volumes are the Micropædia and the Macropædia, respectively. The last three volumes are the 2002 Book of the Year (black spine) and the two-volume index (cyan spine). The Encyclopedia was once very small, the first edition in 1768 only had 3 books. Slowly it became bigger. The last edition, the 15th, started in 1974, has 29 books, plus two indexes. It includes an extra book called Propaedia, to classify knowledge. The 29 books and made up of a Macropaedia and a Micropaedia. The Macropædia is a larger one, with more detailed articles that can be as long as 300 pages, made up of 17 books, while the Micropædia is the smaller one with many much shorter articles that are usually less than 750 words. The Micropædia is used for fast-checking, but if you want more detailed information you have to use the Macropædia. Each book is very big, more than 1000 pages per book. Every year, an update book was published. The last yearbook was for 2018, published in 2017. The articles in the Britannica are for educated adults, not for children, and written by about 100 full-time editors and over 4,000 expert contributors. Many people think it is the best encyclopedia[source? ], but Wikipedia is still more popular[source? ], being free to use. The Britannica is the oldest English-language encyclopaedia now. It was first published between 1768 and 1771 in Edinburgh, Scotland and grew very popular, with its third edition in 1801 comprising of 21 books. The size of the Britannica is almost the same since the 1930s, with about 40 million words on half a million topics. The encyclopedia was once owned by British people. In the 20th century it was American-owned, but it is still written in British English. Over time, the encyclopedia has had difficulties trying to earn money, which almost every encyclopedia is facing. There are 15 official editions of the encyclopedia, with some extensions to the 3rd and 5th editions (see the Table below). Actually, you can say that the 10th edition was only an extension to the 9th edition, and the 12th and 13th editions were extensions to the 11th edition. The 15th edition was reorganised in 1985, and the updated, current version is the 15th edition. Through the encyclopedia's history, the Britannica wanted to be an excellent reference book and to provide learning materials for those who want to study. In 1974, the 15th edition had a third wish: to put together all that everyone knows. The history of the Britannica can be divided into five main eras, or lengths of time. In its first years (1st–6th editions, 1768–1826), the Britannica was controlled by the people who first wrote it, Colin Macfarquhar and Andrew Bell, and by their friends and relations, such as Thomas Bonar, George Gleig and Archibald Constable. The Britannica was first published between 1768 and 1771 in Edinburgh, a city in Scotland, called the Encyclopædia Britannica, or, A dictionary of arts and sciences, compiled upon a new plan. It was written to replace the French Encyclopedie. Its logo, which is the floral emblem of Scotland, shows that the Britannica was a Scottish business. The encyclopedia being created is one of the most famous events that happened in the time when Scotland started inventing many things, or the Age of Enlightenment. The Britannica started as three-book set ( in the 1st edition) written by one young editor—William Smellie— Slowly, the Britannica changed, in the first era, to a 20-book set written by many people. Although a few other encyclopaedias had been fighting with the Britannica, such as Rees's Cyclopaedia and Coleridge's Encyclopaedia Metropolitana, these encyclopedias either went bankrupt or were not finished because the people writing them argued. When the first era was almost over, the Britannica had many people helping to write it, all having different types of skills. The encyclopedia managed to get so many people by inviting their friends to help. The middle 19th century editions of Encyclopædia Britannica included important research such as Thomas Young's article on Egypt, which included the translation of the hieroglyphs on the Rosetta Stone (pictured). In the second era (7th–9th editions, 1827–1901), the Britannica was owned by the Edinburgh company, A & C Black. Although some of the people who helped write the Britannica helped because they were friends of the most important editors, many other people wanted to help the Britannica because it was becoming very successful. These people came from many other countries, and some of them were very famous for the things they wrote about. An index of all the articles was written to add to the 7th edition of the encyclopedia, and they continued to make an index until 1974. The first English chief editor was Thomas Spencer Baynes, who led the making of the famous 9th edition, which is also called the "Scholar's Edition". The 9th edition is considered to be the Britannica most meant for students ever written. However, at the end of the 19th century, the 9th edition was already too old and the Britannica had many financial problems. In the third era (10th–14th editions, 1901–1973), the Britannica was owned by American people, who started to advertise a lot to earn more money. The American owners also slowly made the Britannica's articles simpler, so it could serve more people. The 11th edition is said by many people to be the best edition of the encyclopedia. Its owner, Horace Hooper, worked extremely hard to make the 11th edition perfect. When Hooper had financial problems, the Britannica was managed by Sears Roebuck for about 18 years (1920–1923, 1928–1943). In 1932, the vice-president of Sears, Elkan Harrison Powell, owned the Britannica. In 1936, he started to continuously revise the encyclopedia often (still done so today), in which every article is checked at least two times every ten years. This was a big difference from before, when the articles were not changed until they wrote a new edition, about every 25 years, with some articles used again without revising them. He also quickly made some educational products which made the encyclopedia even more well known by everyone. In 1943, William Benton managed the Britannica until his death in 1973. Benton also set up the Benton Foundation, which managed the Britannica until 1996. In 1968, near the end of this era, the Britannica celebrated its 200-year anniversary, and in 2014 published the last printed edition. Encyclopædia Britannica International Chinese Edition, translated from the original 15th edition with a few articles modified or rewritten, is published by Encyclopedia of China Publishing House; the 19th and 20th of the all 20 volumes are index. Since 1985, the Britannica has had four parts: the Micropædia, the Macropædia, the Propædia, and a two-book index. The Britannica's articles are found in the Micropædia and Macropædia, which contain 12 and 17 books, respectively, each book having about one thousand pages. The 2007 Macropædia has 699 detailed articles, which can be as short as 2 pages and as long as 310 pages, and having references and named writers. The 2007 Micropædia has about 65,000 articles, and about 97% contain less than 750 words, no references, and no named contributors. The Micropædia articles are supposed to be for quick fact-checking and to help in finding more information in the Macropædia. The Macropædia articles are supposed to be well-written articles on their subjects and articles of information where you cannot find anywhere else. The longest article (310 pages) is on the United States, and came from putting the articles on the individual states together. Information can be found in the Britannica by following the notes telling where people can find more information in the Micropædia and Macropædia; but there are very little of this, with about only one of this every page. So, readers are asked to try to use the indexes or the Propædia, which organises what is in the Britannica volumes by topic. The use of the Propædia is its "Outline of Knowledge," which wants to organise all of everything people know. The Outline is thought through by the Britannica's editors to decide which articles should be included in the Micropædia and Macropædia. The Outline is also intended to be a study guide, and to tell a student who wants to learn a topic in depth what articles to use. However, libraries say that very few people use it, and reviewers recommend the encyclopedias to not print it anymore. The Propædia also has diagrams printed on transparent paper of big topics and a section which lists the people working together to make the encyclopedia. Altogether, the Micropædia and Macropædia have about 40 million words and 24,000 pictures. The index has 2,350 pages, which lists all the 228,274 topics written about in the Britannica,. The Britannica uses the British spellings and not American spellings. For example, it uses colour (not color), centre (not center), and encyclopaedia (not encyclopedia). However, this rule is not always followed, for example defense and not defence. The other spellings of the word is sometimes shown with a link, for example "Color: see Colour." Since 1936, the articles of the Britannica have been revised often, with about 10% of the articles brought to be re-written each year. One Britannica website said in 2007 that 46% of the articles were revised in the past three years; but another Britannica web-site says only 35% of the articles were revised. The way the articles are arranged (in alphabet order) in the Micropædia and Macropædia is very accurate. Non-English letters are ignored and articles with numbers such as "War of 1812" are arranged as if the number had been written out ("War of Eighteen-twelve"). If the articles have the same names, articles about persons go first, then by places, then by things. People with the same names are arranged first alphabetically by country and then by their time. Similarly, places that have the same names are arranged by alphabet by the country they are in. 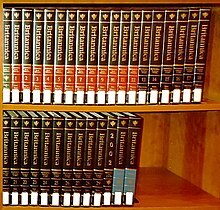 There are a few smaller versions of the Britannica encyclopedias. The Britannica Concise Encyclopædia, written in one book, has 28,000 shorter articles. Compton's by Britannica, published in 2007, with the old Compton's Encyclopedia, in it is written for teenagers who are 10–17 years old and has 26 books and 11,000 pages in it. A Children's Britannica was published by the company in 1960; this was edited by John Armitage and written for His Royal Highness the Prince of Wales; the writers were almost all British. Other books are My First Britannica, written for children who are six to twelve years old, and the Britannica Discovery Library, written for children who are three to six years old (issued in 1974 to 1991). Since 1938, Encyclopædia Britannica, Inc. has published a Book of the Year every year, with information about the past year's events, which is written online since the 1994 edition (with the events of 1993). The company also publishes a few books on special topics, such as Shakespeare: The Essential Guide to the Life and Works of the Bard (Wiley, 2006). The Britannica Ultimate Reference Suite 2006 DVD contains over 55 million words and over 100,000 articles. It includes 73,645 Britannica articles, with the other articles from the Britannica Student Encyclopædia, the Britannica Elementary Encyclopædia and the Britannica Book of the Years (1993–2004), plus a few old articles from old editions of the encyclopaedia. The whole DVD also includes other bonus tools including maps, videos, sound clips, animations and web links. It also has study tools and a dictionary and thesaurus from Merriam-Webster. Encyclopædia Britannica Online is a web site with more than 120,000 articles and is updated often. It has features, updates and links to news reports from The New York Times and the BBC every day. People need to pay to use the website. Special discounts are given to schools, colleges and libraries since these big groups of people are important in Britannica's business. Articles can be read online for free, but only the first few sentences can be seen. Beginning in early 2007, the Britannica let people read the articles for free if they are linked to another website, since these links let the articles appear more often and easily in search engines. On 20 February 2007, Encyclopædia Britannica, Inc. said that it was working with mobile phone search company AskMeNow to make an encyclopedia in phones. Users can send a question by text message, and AskMeNow will search Britannica's 28,000-article encyclopedia to answer the user. An idea to use a wiki-Britannica was announced on the June 3, 2008. A lot of people will be involved, with the Britannica staff editing important parts. ↑ Day, Peter (17 December 1997). "Encyclopaedia Britannica changes to survive". BBC News. Retrieved 2007-03-27. Sales plummeted from 100,000 a year to just 20,000. ↑ 4.0 4.1 4.2 4.3 The New Encyclopædia Britannica (15th edition, Propædia ed.). 2007. pp. 5–8. ↑ Herman, Arthur (2002). How the Scots Invented the Modern World. Three Rivers Press. ISBN 978-0-609-80999-0. ↑ Krapp, Philip; Balou, Patricia K. (1992). Collier's Encyclopedia. 9. New York: Macmillan Educational Company. p. 135. LCCN 91-61165. Many people said that the first edition of the encyclopedia was very inaccurate, and had many problems in it. ↑ 7.0 7.1 Kister, KF (1994). Kister's Best Encyclopedias: A Comparative Guide to General and Specialized Encyclopedias (2nd ed.). Phoenix, AZ: Oryx Press. ISBN 0897747445. ↑ 8.0 8.1 Kogan, Herman (1958). The Great EB: The Story of the Encyclopædia Britannica. Chicago: The University of Chicago Press. LCCN 58-8379. ↑ reviews by the Editorial Board of Reference Books Bulletin ; revised introduction by Sandy Whiteley. (1996). Purchasing an Encyclopedia: 12 Points to Consider (5th ed.). Booklist Publications, American Library Association. ISBN 0-8389-7823-1. ↑ 10.0 10.1 10.2 10.3 Sader, Marian; Lewis, Amy (1995). Encyclopedias, Atlases, and Dictionaries. New Providence, NJ: R.R. Bowker (A Reed Reference Publishing Company). ISBN 0-8352-3669-2. ↑ 11.0 11.1 The New Encyclopædia Britannica (15th ed.). 2007. Index preface. ↑ "Australian Encyclopædia Britannica, promotional materials for the 2007 Britannica". Retrieved 2007-04-10. ↑ The New Encyclopædia Britannica (15th edition, Micropædia preface ed.). 2007. ↑ "2003 Britannica Concise Encyclopedia". Encyclopædia Britannica (UK) Ltd. Retrieved 2007-04-11. ↑ "2007 Compton's by Britannica". Encyclopædia Britannica (UK) Ltd. Retrieved 2007-04-11. ↑ Children's Britannica. ed. John Armitage. 1960. Encyclopædia Britannica Ltd. London. ↑ "Britannica Discovery Library (issued 1974–1991)". Encyclopædia Britannica (UK) Ltd. Retrieved 2007-04-11. ↑ "2007 Ultimate Reference Suite DVD". Encyclopædia Britannica (UK) Ltd. Retrieved 2007-04-11. ↑ "Britannica Online". Britannica.com. Retrieved 2006-10-23. ↑ "Britannica Online Store—BT Click&Buy". Britannica.com. Retrieved 2006-09-27. ↑ "Instructions for linking to the Britannica articles". Britannica.com. Retrieved 2007-03-26. ↑ AskMeNow, Inc. (21 February 2007). "Encyclopaedia Britannica Selects AskMeNow to Launch Mobile Encyclopedia". Press release. http://www.mirror99.com/20070221/encyclopaedia_britannica_selects_askmenow_to_launch_mobile_geae.jspx. Retrieved 2007-03-26. Wikimedia Commons has media related to Images from Encyclopædia Britannica. Encyclopædia Britannica Online. The official website. "Encyclopaedia Britannica". In Encyclopaedia Britannica Online. 1768–2005:l'aventure Britannica. History of the Britannica, from the French Britannica site. Vintage Britannica or "Evolving Knowledge". Excerpts on various topics drawn from various Britannica editions. Preface to the 1st edition of the Britannica, by William Smellie. The article "History" in the 3rd edition of the Britannica. Articles and illustrations from the 9th and 10th editions of the Britannica. Scanned version of the 11th edition of the Britannica. James Mill's essay on "Government", from the Supplement to the 5th edition of the Britannica (1820). Technical aspects of the Britannica's online and CD/DVD-ROM editions. Britannica disagrees with Wikipedia comparison study. A comparison of the two encyclopedias by Panagiota Alevizou, published in the Educational Technology & Society journal. "Dusting off the Britannica". Article from BusinessWeek magazine (1997). "Death of a salesforce". Article from Salon (1996). "The Work of the Encyclopedia in the Age of Electronic Reproduction". Article by Alex Soojung-Kim Pang in First Monday. The Crisis at Encyclopædia Britannica Kellogg School of Management. This page was last changed on 3 April 2019, at 06:22.